Sometimes, I walk home with my friend and co-worker, K. We spend most of the walk talking food. Tonight, K suggested making these – inspired by Smitten Kitchen. mostly, i’m in it for the cheese. Preheat the oven to 400 degrees. Scatter the broccoli and cauliflower florets in a large baking pan, coat with a bit of olive oil, and toss with salt, pepper, and a dash of chili powder. Roast for about 20 minutes. As the florets roast, heat olive oil in a saute pan, add the onions and cook over medium heat for a few minutes, until translucent. Add the jalapeno and poblano peppers and cook another 5-6 minutes. When the florets are done roasting, add to a food processor and roughly pulse them just a few times – you don’t want them turning them to mush. Add the lime juice and give a quick stir with a fork. 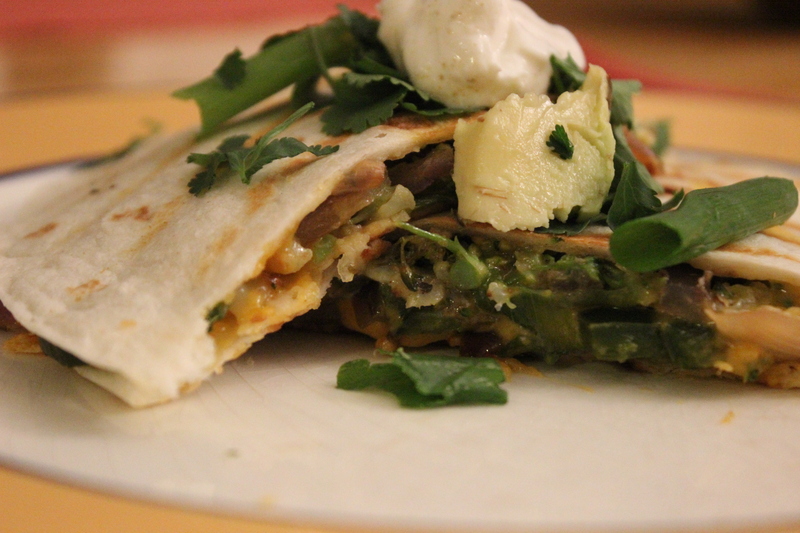 Build your quesadilla: spread the broccoli/cauliflower mixture over one tortilla, add the onion and peppers over it, top with cheese and a couple of scallions. Cover with one more tortilla on top. Heat a large grill pan over medium heat and cook the quesadilla for about 3 minutes before flipping – very carefully – to the other side, and cooking another 2-3 minutes. Cut into wedges and serve with a bit of sour cream (I gussied mine up with a little lime juice and cumin), cilantro, and avocado. 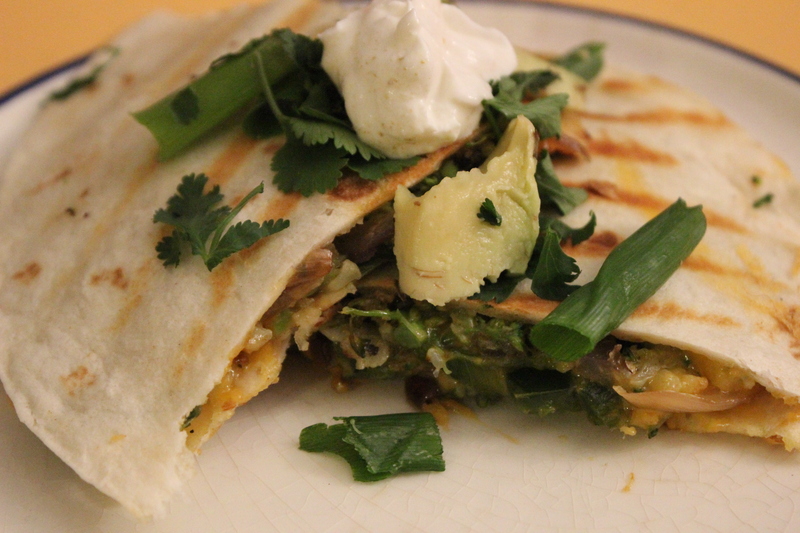 Did I use one too many pans to make…quesadillas? While we’re on the subject, does anyone need to use a food processor to make…quesadillas? Yes, and absolutely not, respectively. Still, these were delicious (although honestly, how could they not be, between veggies, cheese and carbs?!). I think the Husband will be mighty pleased to find these in his lunch bag tomorrow. It’s been at least two or three weeks since I last busted out our crockpot, which just isn’t right. 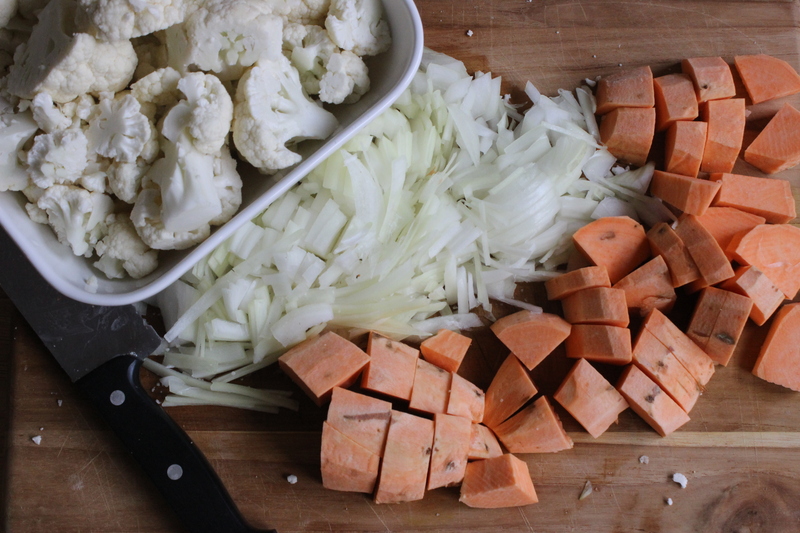 Thinking about how to right that wrong, I decided it was time to build on the earlier success of this week (I was pretty pumped for being able to rescue the curried red lentil soup) – and do it all over again. That’s how you learn, right? Recipe inspired and adapted from Food & Wine. these veggies are excited to get crockpotin’. Heat oil in a hot saute pan. Season the chicken with salt and pepper and sear them on each side, until just golden brown. Transfer to your crockpot. In the same saute pan, reduce the heat, add a bit more oil and then your onions. Saute until starting to soften, then add garlic & ginger. Cook for a minute, then add curry powder and chili paste. Cook another minute or so and then add your broth, scraping up the yummy bits from the pan. Pour over the chicken in the crockpot. 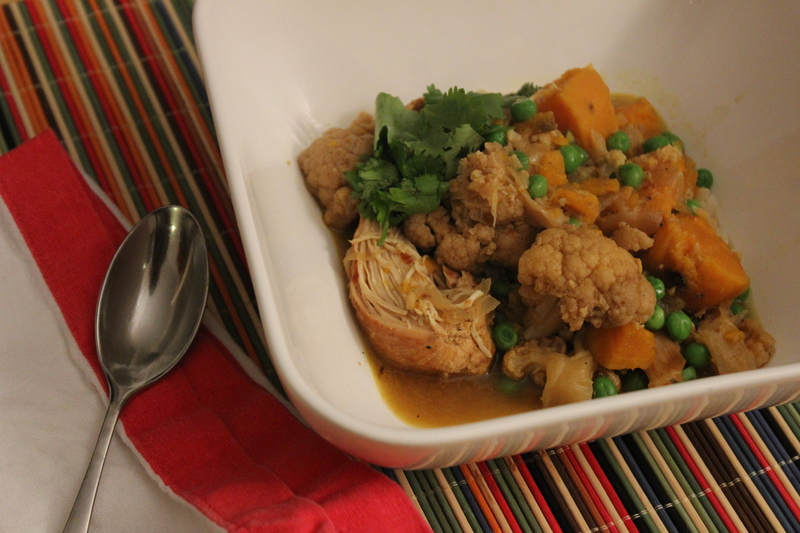 Add sweet potato, cauliflower, and coconut milk to the crockpot and give it a quick toss. Season with salt and pepper. Cook on low for about 7-8 hours, until chicken is cooked and vegetables are tender. Stir in the peas until warmed through. Serve over brown rice, squeeze with a hit of lime juice, and top with cilantro. Who doesn’t love cauliflower? 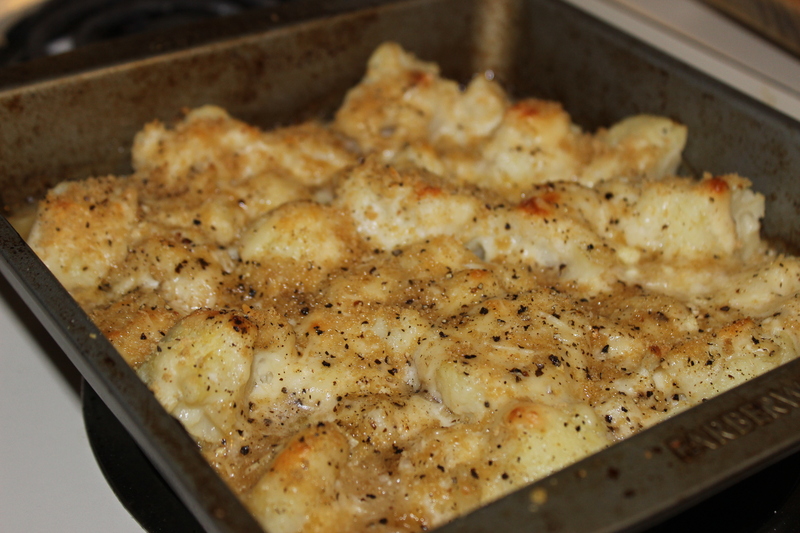 More importantly, who doesn’t love cauliflower drenched in cheese, bechamel, and bread crumbs…Ina Garten style!? No one? That’s what I thought. I bought a head of cauliflower on a whim this past weekend because it was on sale. I had some healthful thoughts of roasting it with a bit of olive oil and garlic and serving with our butternut squash soup. Then we ran into our friend in the bookstore, and I knew I needed a new plan. If the soup had been a bust, we needed something to tide over hungry stomachs. Enter Ina Garten and her blueprints for making all vegetables even tastier fare. This recipe is more of a weekend affair, as it takes a while, mostly because of the bechamel (lots of stirring needed for this one). It’s a good one for company, though, as you can assemble the dish in advance and then just pop it in the oven. If you have leftovers, reheat them in the oven (or a toaster oven! )…microwaves tend to take out the delicious crunch. 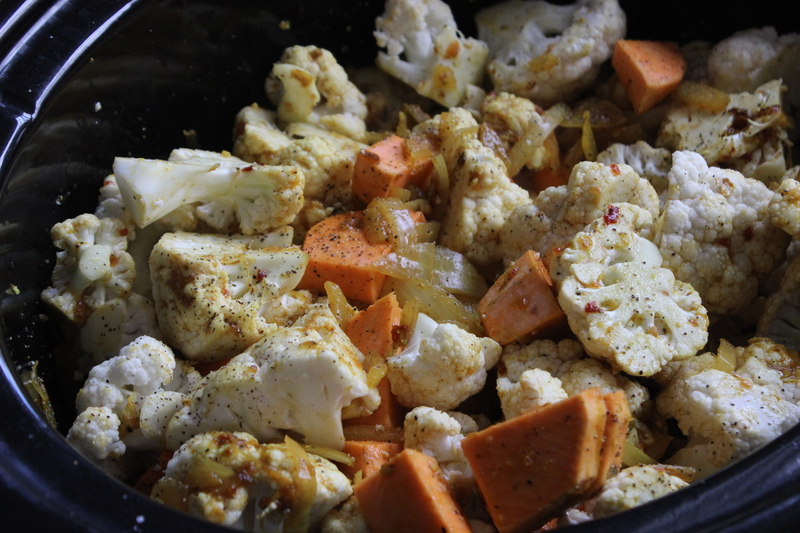 Bring a large pot of salted water to boil; cook the cauliflower about 8 minutes – until tender, but still firm. Drain. Meanwhile, melt 1/2 the butter in a saucepan over low heat. Add the flour, stirring constantly with a wooden spoon. Pour the hot milk into the pan and stir until it comes to a boil (it will take a while!). As soon as it boils, whisk constantly for about a minute, until the sauce starts to thicken. Off heat, add about a teaspoon of salt, pepper to taste, the nutmeg, half of the Gruyere and all of the Parmesan, minus a handful, to the bechamel. Mix through. Pour one third of the sauce on the bottom of a baking dish (I used a 9×9 square). Place the cauliflower on top and spread the rest of the sauce evenly. Combine the breadcrumbs, the rest of the Gruyere, and a handful of Parmesan and then sprinkle on top. (This is when it gets really decadent). Melt the rest of the butter and then drizzle over the gratin. Sprinkle with salt and pepper and bake for about 30 minutes, until the top starts to brown. Serve immediately. Do you see the amount of cheesy goodness in here? Enough said!